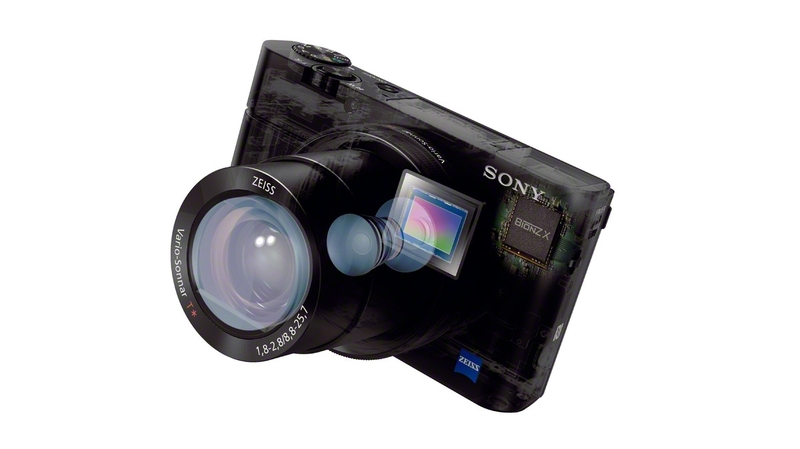 Sony has updated its flagship compact camera for 2014. At first glance, the Sony Cyber-shot DSC-RX100 III seems like a retread of the RX100 and RX100 II, thanks to its 20.1 MP 1.0-inch back-illuminated Exmor R CMOS image sensor, Full HD 1080p video recording capabilities, 3.0-inch LCD display, and the plethora of Picture Effects and Shooting Modes. Heck, you might even be worried that the zoom lens only reaches 2.9x versus 3.6x. But look a little closer and you'll see the RX100 III is brimming with upgrades and new features. First up, the new RX100 III is faster, thanks to the BIONZ X image processor that's also in the recently announced Alpha 7/7R and Alpha 7S models. Next, that 2.9x optical zoom lens might be shorter, but with an f/1.8-2.8 maximum aperture, this Mach III captures twice as much light at 70mm as the previous generations. Also, this lens features ZEISS T coating to minimize flare and ghosting. Next, Sony has added an LED Tru-Finder Electronic Viewfinder (there was only an LCD display before) AND this year's 3.0-inch LCD display now tilts -- up by 180 degrees and down by 45. Video capabilities have also improved. The RX100 III is the first RX-series camera with Intelligent Active Mode, which reduces camera shake, and the first Cyber-shot with the ability to record in the XAVC S format. This allows for Full HD 1080p recording at 50 mbps, a much higher bit rate than the more compressed AVCHD format (which remains as an available option, since it's better for sharing over Wi-Fi). Also, thanks to the BIONZ X processor, this camera can capture 120 fps slow motion video at 720p HD. Finally, the RX100 III is the first RX-series camera to be compatible with PlayMemories Camera apps, thanks to built-in Wi-Fi and NFC capabilities. This allows users to connect iOS and Android devices to the camera to share images on social networks, back up files, or to even turn a smartphone into a remote shutter (great for longer exposures where you can't bump the camera). Despite all the aforementioned bells and whistles, if you already own an RX100 or RX100 II, there probably isn't enough increase in still image quality to justify an upgrade (especially since all these new fancy features have raised the MSRP). But if you don't already own a previous generation model and you're in the market for a top of the line, compact point-and-shoot camera, definitely give this RX100 III a look. The new Sony DSC-RX100 III will be available this June (2014) for about $800.